Unless you’re one of our partners. Or one of our Religious Directors. Or we think it’s funny. Or…. 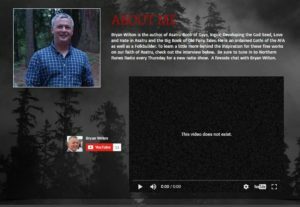 Bryan Wilton, author of several lower-than-average quality E-books is not a racist. People want to say Hitler did it because he hated the Jew. Hitler did it because he loved his country. Andrew Jackson did his thing because he loved his country, and wanted to protect its borders, and wanted to see it grow. Native American will tell you something different. I’m sure they will Bryan, though I can’t possible imagine why. Wilton’s stumbling efforts to conceal his racialist ideology are well known and have been within the online Heathen “community” for years. Thus was it a somewhat befuddling development in late 2015 that TAC, once again claiming an almost radical agenda of inclusivity, appointed him to the critical position of “Religious Director.” In this seat Wilton would be in direct control of the development of TAC’s religious identity and the direction of the organization’s clerical and liturgical programs. Once again TAC had cozied up to bigotry, placing a man with an unquestionably suspect history into the single most important seat of power a religious organization can hold: that of chief priest. Perhaps, were we merciful, TAC might be granted some minimal reprieve for its failure to uncover Wilton’s history. As we will discuss in a moment, heretofore readily available hard evidence had at some point become an inexplicably rare species on the ground. It was never really in question, though, that even at the time Wilton’s reputation was poor. Even apart from any explicit racism, Wilton was well known for his support of his friends at the AFA and their particularly insidious brand of Folkish belief. As part of their own mission, the AFA prioritizes “the preservation of the Ethnic European Folk and their continued evolution.” Just in case that is a little too murky, they spell it out further: “by Ethnic European Folk we mean white people.” This “whites-only” vision of Germanic Neopaganism was the model for which Wilton was an advocate during his first tenure as Folkbuilder, and an even more radical 14/88 platform has replaced it since his return to that position. Further, Wilton has released a number of tweets and podcasts over the years that have made his position on race, apologetically antagonistic as it is, clear enough. TACWatch must admit that here our case becomes somewhat infirm. While anyone who recalls Wilton’s behavior during his many audio and video recordings can make no whole-hearted argument that his reputation is pristine, we at TACWatch have been unable to produce any solid evidence of overt personal racialism. This isn’t because we haven’t looked. It isn’t because, after pouring through the hours of material Wilton had created prior to Feb 2016, we were simply unable to find any convincing article to support our argument. It’s because none of the content seems to exist anymore at all. For whatever reason, innocent or ominous, Wilton’s history prior to signing on at TAC seems to have been scrubbed thoroughly. Using the advanced search function on his Twitter account, it’s possible to find tweets beyond the date it was archived (February 13th, 2016), but the only bits of evidence remaining are “soft” racism indicators like adulation of the confederate battle flag. Without speaking to the man directly, it’s impossible to say why this purge of content occurred. 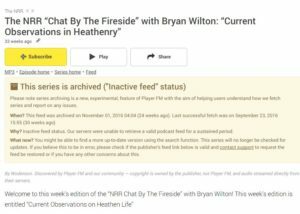 It’s likely that each of the various hosts for Wilton’s media prior to February 2016 were disabled or lost for independent reasons, unrelated to any particular agenda. Indeed, Northern Runes Radio appears to have been abandoned due to vitriolic public response to a single episode. As tempting as it may be to assign a sinister motive to this, it’s not ultimately helpful to the discussion. Further, it isn’t absolutely necessary. There isn’t a lot of credible or enthusiastic denial that Wilton is a racialist now, and has always been. TAC, an organization that energetically asserts its anti-racialist slant, should have been aware of Wilton’s associations and the controversies already surrounding him. Even when removed from a strictly Heathen context, reputation exists for a reason, and TAC had only to conduct the thinnest effort of vetting processes to discover that Wilton’s was already well known. Also well known before his appointment was Wilton’s vitriolic dislike of self-proclaimed “Lokeans.” This is not an uncommon stance across Heathenry. Indeed, you will find no friendly sentiment towards the idea of Loki worship among the authors of TACWatch or our parent site Real Heathenry. Still, while we may offer passionate or sometimes dismissive arguments against the historical authenticity and worth of such a practice, it has never been the policy of our parent site to venomously attack individual practitioners. Wilton, though, has long considered “Lokeans” to be appropriate targets of scorn and direct abuse, going so far as to state in his 2014 work Loki: Bound Between Ice and Fire that all who claim to have knowledge of Loki are unintelligent, indignant, drug addicted, alcoholic, lazy, arrogant examples of “ego…run full tilt out of control.” This isn’t a thoughtful discussion about the lack of merit to the “Lokean” argument. It isn’t even a snide hand-wave. It’s an outright screed, a hateful assault on a group of people that TAC has long promised to demarginalize and accept openly. It came as little surprise then, when in mid February 2016, only weeks after his appointment, Wilton exercised his authority as lead priest by suspending all discussion of Loki worship. Without so much as a warning, the Religious Director simply expelled the idea and its adherents, responding to any criticism of his action with insults and liberal application of the block function. The response of the esoteric and ill-educated population of the “Community” was predictable. Individual members and chapter abandoned the site in scores. In a dance that has become all too familiar, the leadership of TAC (presumably sans Wilton) eventually removed the new edict, along with any evidence that the event had occurred. They awkwardly deflected any questions, assuring that an announcement would be made soon. Within a few hours an official statement appeared, releasing Wilton from his position. The decision had apparently been made amicably and mutually. Without any further public scene, Bryan Wilton packed up his desk and slinked out of the building. That TAC sacked Wilton should not be seen as commendable. Wilton had egregiously violated the bylaws, and in doing so had placed TAC in a precarious legal position. The leadership had no choice but to remedy the situation with expedience and finality. Otherwise they’d be vulnerable to IRS investigation, loss of their tax exempt status, and possibly even dissolution of the company. The canning of Bryan Wilton didn’t necessarily indicate any condemnation, or even that TAC disagreed with his sentiment. It represented the only adequate and convenient way to relieve the legal danger into which TAC had stumbled. We must wonder, especially after the incident with NCKAZ, how TAC had found itself allied to supremacy and hate once again. Just as in that debacle, we are left with a handful of logical conclusions. It is possible that TAC knew full well of Wilton’s suspect history and associations, and hired him anyway. This conclusion would suggest that the leadership of TAC itself is aligned with racialism. This continues to seem very unlikely, given both the frequent adamant denials by TAC and the lack of explicit evidence of (this type) of poor behavior. Likelier, it is possible that TAC leadership is so blisteringly incompetent that they simply hadn’t learned their lesson. If this is true, then TAC had still failed to institute a proper vetting process in the wake of the NCKAZ explosion. In fact, they had somehow managed to double down on the error but appointing Wilton to their Board instead of just partnering with him. Perhaps the most likely conclusion is that TAC just doesn’t care. If the project is, as many have suggested, a basic numbers game meant to shore up egomaniac President Seth Chagi’s ailing sense of self-importance (or bank account), then it’s an obvious play to court anyone whose popularity may outweigh the public backlash against them. It’s possible that TAC did, indeed, know of Wilton’s less than covert racism. Frankly, it’s nearly impossible that they didn’t know of his disdain of the “Lokeans” they so claim to champion. But Wilton, by his own self aggrandizing claim, is a famous author. He is a man who unarguably has a following that could have brought an irresistible flood of “likes” and t-shirt orders to Chagi’s pity party. It wouldn’t ultimately matter to Seth how much another dirty association would cost, so long as it paid a net positive. Clearly none of these conclusions are flattering. At best, we are left to assume some combination of apathy, incompetence, and avarice. The entire situation is a bad look for a business so enamored with the idea of inclusvity. Still, at least we can hope that this episode finally taught TAC the lesson they so desperately needed to learn. Certainly they would never make exactly the same mistake again. UP NEXT: Digging In III: TAC Makes Exactly the Same Mistake Again.